After the disappointment of not finding the venue of Dunkerque v Amiens in Teteghem, it was back to dependable English football; with Sat Navs and mobile internet. 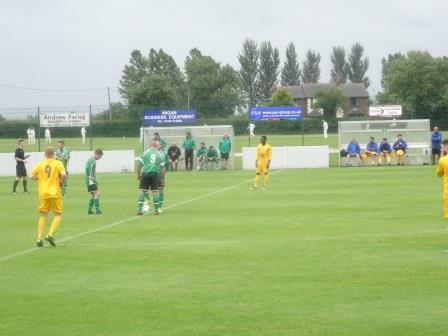 We headed up the M6 for the Charity Shield of the West Lancs League – the Wilf Carr Memorial Trophy. This marks the ribbon cutting of the new West Lancs league season, with the current champions playing the winners of the Richardson Cup. 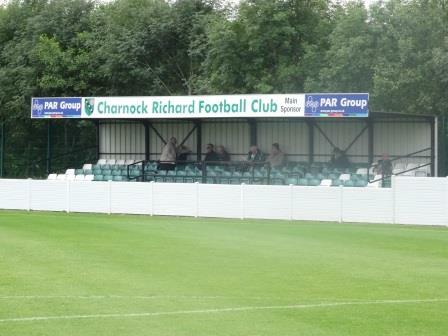 Charnock Richard actually won both these, so Fulwood, as cup finalists, formed the opposition. Mossie Park is one of those rare grounds, lying below the step six radar, with floodlights and a stand. Rumour had it they’d applied to the NWCL, but for now they’re current champions and stalwarts of the well respected West Lancs league. They were founded in 1933, entered the West Lancs league in 1993, which they have won seven times, including the last three seasons straight. Charnock Richard itself is a very small village between Preston and Wigan. It was founded in the 13th century by a landowner called Richard, donating his name to distinguish it from the nearby Heath Charnock. Most people have heard of it, but only in the Motorway Services sense of the name. For me Charnock Richard services is up there in the Champions League places of Services, alongside Toddington, Watford Gap, Membury and Hilton Park. The ground is in Charter Lane, just before you get to the village centre. Car parks lay either side of the country lane, with the clubhouse on the other side of the road. Four stick-like floodlights look down on the pitch, adorned by a filled-in surrounding board and modern stand. It’s a great venue, that wouldn’t be out of place a few leagues up the pyramid. It backs on to the cricket ground next door on the long side. Fulwood Amateurs, from Fulwood in Preston, were promoted from Division One last season, to join the West Lancs elite this year. With Charnock being thrice current champions, Fulwood were very much the underdogs today. 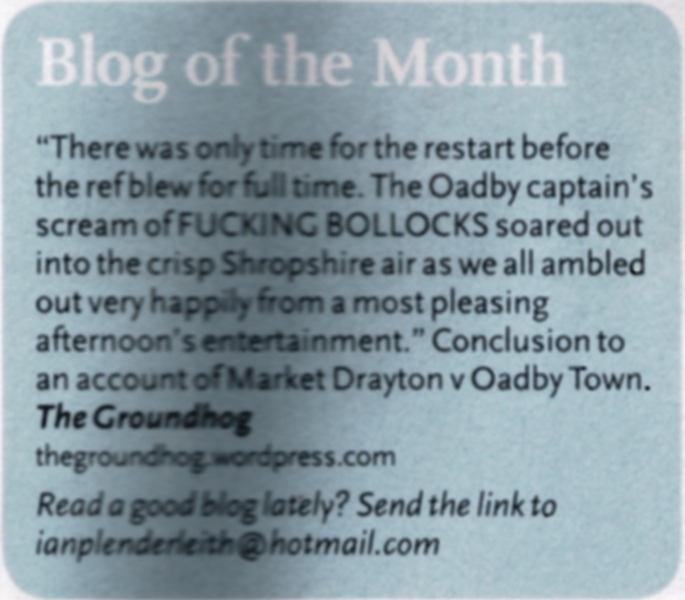 The first half was lamentable, dire, abysmal. Both teams went at it with plenty of energy but little strategy. It was played at a ferocious pace with man marking and hustling agogo. Chances were at a higher premium than 19 year old Porsche drivers’ insurance. Something had to give and Charnock duly obliged by having two players sent off in quick succession before the break for reckless tackles. Going into half time it was 11 v 9 and the chance of a second half spectacle. The second half was as fascinating as the first wasn’t. Underdogs Fulwood had a two man advantage; while a one man advantage can often be fruitless, a two man advantage is rarely wasted. Fulwood did dominate the half, but came up against a brick wall in Charnock’s defence. They tried everything to no avail, the hosts soaked up everything. The best moment of the match came on 65 when, after defending s(t)olidly for the first 20 minutes of the half, a hooked through ball found Carl Grimshaw 30 yards from the Fulwood goal and on side. He chose to whack it first time, a choice which throughout all steps of football 99 times out of 100 results in a throw in or the ball making orbit. Grimshaw’s strike formed a perfect parabola over the keeper and in to the net. Great scenes ensued and disbelief from the away bench. 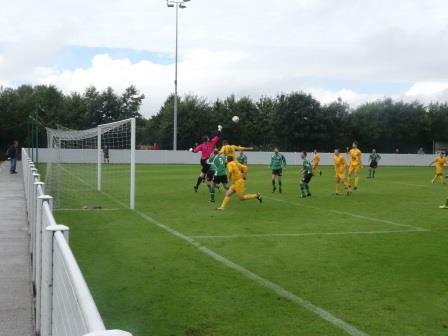 I was rooting for the nine men of Charnock to hold on, but just minutes from time a fast cross from the right was tapped in, and then minutes later a similar move was finished off from close range for 1-2. What started out as the stodgiest match ever turned out to be a bit of a thriller. It’d be good to see the hosts in the NWCL before long. 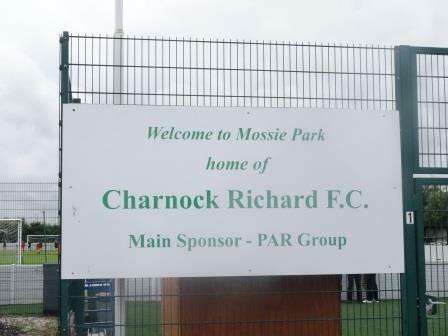 This entry was posted in Travelog and tagged Charnock Richard FC, Fulwood Amateurs, Mossie Park, West Lancs League. Bookmark the permalink.